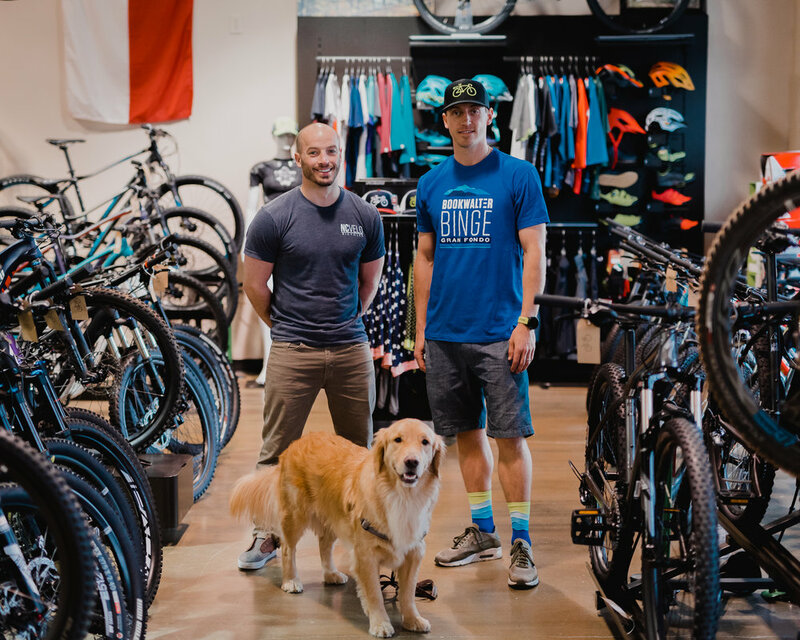 NC Velo is a family-first bicycle boutique in South Charlotte. Locally owned and operated by brothers Jay and Kyle Wyatt. NC Velo opened its doors on July 4th 2016 with a goal to keep their Carolina community ‘riding happy’. They offer premium brands - Specialized, GIANT, BMC & Colnago - in a relaxed and comfortable space. The shop’s welcoming ethos is due in large part to Winston, the golden shop dog who greets each and every customer that steps inside. NC Velo is open seven days a week and offers numerous weekly rides, both road and trail, with indoor training classes available as well. 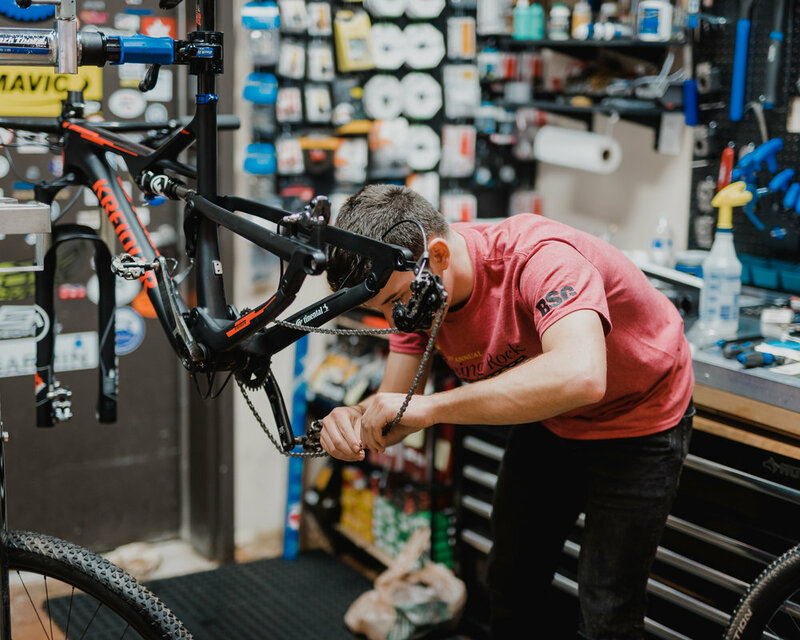 The expert staff delivers first-class services with regularly scheduled instructional clinics for maintenance and riding. Bicycling can be one factor to indicate the health of a city; however, while there are plenty of bicycle commuters in Charlotte, a vast majority simply share the passion to pedal. The natural resources that CLT and the state of North Carolina provide offer endless opportunities for exploration and fitness. The year-round beautiful weather is a major factor! What is your advice to someone who is intimidated to get on a bike and ride in the streets? Bring your bike to NC Velo for a safe and guided first ride! We are happy to demonstrate proper riding etiquette and signaling which allows better anticipation on the road for both drivers and fellow riders. Sidenote: Do your best to avoid rush hour as Charlotte is ever-expanding and traffic can get busy at times. Above all, ride with confidence and be thoughtful. Understand your rights as a cyclist and always obey the rules of the road. What is your advice to the experienced cyclist in Charlotte NC? Keep pushing yourself and explore new terrain. Roadies and mountain bikers alike can test their limits close by in the Blue Ridge Mountains. Also, continue to set a positive example for our riding community. Take time to share your perspective with the younger or newer riders so proper etiquette is understood and their experience will be richer from the first pedal stroke. How can locals get more involved in the bicycle conversation in Charlotte? Stop by the shop! There are endless ways to engage in the bicycle community here in the Carolinas even if you don’t have a bike. From trail workdays to town hall meetings to charity events, there is an outlet to get involved regardless of your ability or skillset. The 24 Foundation is a great example of a cancer-fighting charity here in CLT that focuses on bike rides and community events to broaden their outreach. What are your favorite routes in CLT? For the roadies in our shop, we prefer the rolling hills south of Charlotte as they offerchallenging terrain with countless miles of pristine country roads. The historic town of Waxhaw is convenient for a quick stop to recharge with coffee, bites or brews. NC Velo offers safe and fun group rides on these routes each Wednesday night and Saturday morning. For the mountain biker, Charlotte has an abundance of trail systems. From greenways to single track, all levels of riders have much to enjoy. Special thanks to the local non-profit Tarheel Trailblazers for volunteering, permitting, building and maintaining much of the network in place today. NC Velo has funded the current project at Ballantyne District Park to create several new miles of hiking and biking trails behind the Morrison YMCA. Contact the shop to schedule a quick tour, go check out the trails on your own, or join us each Wednesday evening for a group trail ride. All are welcome! What is the #1 safety tip you have for a beginner? …enthusiast? For beginners, always wear a helmet! It’s a simple and affordable way to protect yourself. If you are experienced, a helmet may have already saved your life. For those thinking helmets are not fashionable, check out the Italian cycling brand KASK, located in South End. Support a local CLT business and check out their sleek and stylish products! Bicycling is already thriving in Charlotte! Whether a road enthusiast, an avid mountain biker or a casual neighborhood rider, please understand we are all ambassadors of the sport. Continue to set an example by engaging positively with drivers and encouraging others to get outside and pedal. A healthy lifestyle benefits us all!